The challenges of opening your own law practice are daunting especially for a new lawyer. If you have the book “How to Start and Build a Law Practice” or are thinking of buying it, this DVD (CD) is for you. If you have never previously been responsible for getting clients and keeping accounts, this is for you. 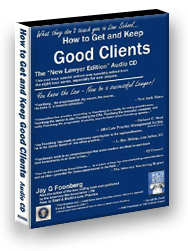 This one hour DVD (CD) contains excerpts from the 8 hour CD set of How to Get and Keep Good Clients. This DVD (CD) was especially made for new lawyers who have just been admitted to practice.